If you're not yet registered with Pinterest and you want to be, you will be need an invitation. I'll be happy to invite you! Just email me your email address and I will promptly invite you. You should hear back from Pinterest in a short amount of time. When I signed up last year it took less than an hour...could be about a day now. The missing link - Pinterest saves the links for you! No more little folders all over your desktop or stacks of magazines with sticky notes pointing you to things you want to save. Connecting you to people who are interested in similar things - you can follow people (pinners) who have a similar aesthetic, love of color and design, sports enthusiast etc. Saves YOU time - depending on how many people you follow you can save time finding all those awe-inspiring images by just following what others are pinning and saving the ones you love to your Boards. Organization - the boards you create will aid in organizing your thoughts as well as the images. You can get some great ideas for writing posts, decorating your home, cooking a new recipe, and visit new blogs too. Share Your Creativity - looking at someone's gorgeous tablescape or cute tutorial on planting roses can be overwhelming and discouraging when you think to yourself "I could never do that". Don't let someone else's passion get in your way...use it to inspire you to be creative in your neck of the woods! 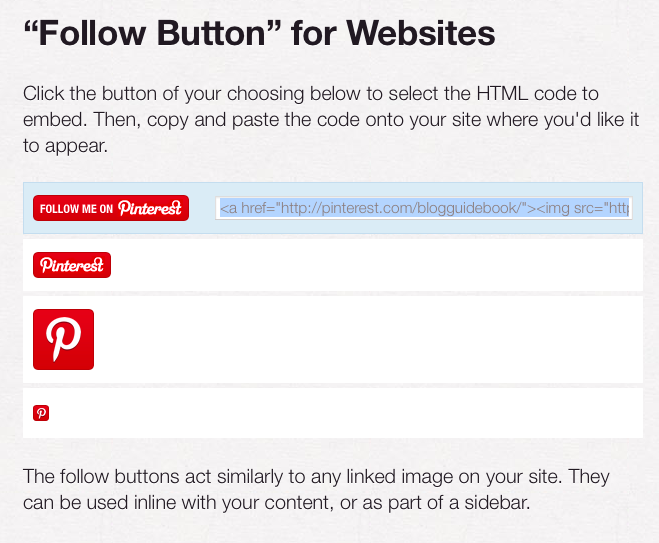 Easily draw attention to the fact that you are Pinterest user by adding a "Follow Me on Pinterest" button which you can create on the Pinterest site HERE. Just add your URL to the coder, choose the style button you want to use, then copy and paste the HTML code to your blog. 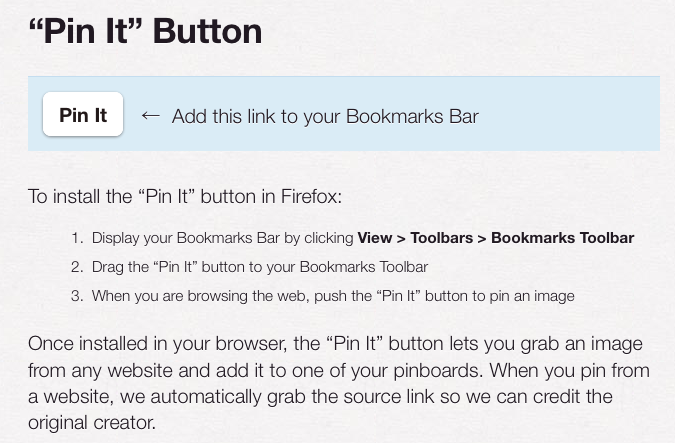 You may also add the Pinterest "Button for Websites" to add the Pin It button to an image. This little button looks somewhat like a Facebook or Twitter button. Pinterest has an awesome HELP section if you ever need to know how to do something on Pinterest. And, of course, you may drop a line to the Blog Guidebook anytime you have a question! Thanks for the info! I don't have a facebook or twitter. I know behind in the times. I just don't like either. Maybe I should start Tweeting.